The Red Roo RH918 Hydraulic Rotary Hoe has a cutting width of 460mm that powers through new or existing garden beds, also ideal for cultivating soil for new turf. The adjustable height handlebar pivots to either side. 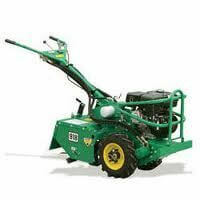 This unit is powered by a 9HP Honda Engine and is ideal for land care professionals, councils, nurseries and the rental industry.